Before the Wright brothers were famous for the first controlled flight, they were in the bicycle business. Their history with bicycles started when Wilbur bought a high wheeled ordinary velocipede in the early 1880s. In 1892 Orville bought a Columbia safety bike made by Pope, which was similar to the Rover by James Starley. In 1892 they opened a bicycle repair shop in Dayton, where they also rented bicycles, and sold accessories. 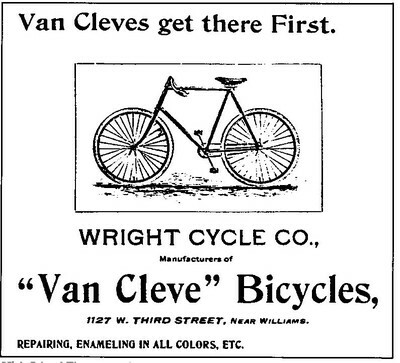 In 1896 they began manufacturing bicycles, offering the Van Cleve and St. Clair models. In their best year, 1897, they made $1500 each in times when $500 per year was a good income in the U.S. They introduced several innovations, including sealed bearings, and bicycle pedals that were left or right threaded so that pedaling tended to tighten the pedals rather than loosen them. This technology is still in use today on bicycles. We were so smitten with the Wright Brother's self-taught accomplishments that we started a bicycle company in Dayton, Ohio to honor their integrity and legacy, from the vantage point of a bicycle saddle. The Gaansari Van Cleve and St. Clair models carry the same spirit in 2005 as they did in the 1890s. I think I might have found a Van cleve bicycle.Its in a elderly mans garage.It has a leather seat that say wrights across the back.Any info would be nice.Like if there were any companys that remanufactured the Van cleve. or how to tell if it is a original.